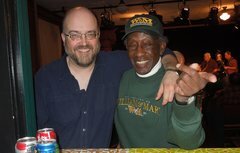 Meadville drummer/educator/tai chi savant and good citizen Cootie Harris celebrated his 90th birthday on Sunday, Feb. 24th with one of his famous Jazz Jams at the Market House. A SRO audience crowded into the smallish second floor auditorium to celebrate with him, while 20 musicians jammed onstage. 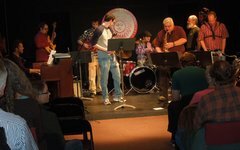 students, and musicians enjoyed the stimulation of playing with others who they might not encounter in their regular gigs. In more recent years, a $5 admission was added to help defray costs of the venue (musicians get in free), and refreshments, including beer, are sold to keep everyone hydrated. Sessions are held roughly every other month. They are currently hosted by Meadville keyboards/pianist Dan Hallett. Watch the JazzErie website calender for date and time for the next session, or call Dan at 814/336-1580 and ask him to add your name to the notification list. Regulars at the jams include Hallett, bassist Sean Dimico (Saegertown), drummer Dave Perry (Franklin), saxophonists Dave Callaghan (Edinboro), Mikel Prester (Meadville), Vaughn McGregor (somewhere south of Meadville), pianist Mike DeWalt (Oil City), guitarist Dave McMillin and drummer John Skendall (both from Meadville) and many others. Plus students -- from Allegheny College, area high schools, and a variety of jazz teachers. Born Elmore Harris in Franklin, PA in 1923, Cootie grew up in a musical family. He joined his brother's band when he was 17, then entered the service after high school. Stationed in Europe post-WWII, Cootie played in Army bands with many fine musicians from grreat U.S. bands -- expanding his knowledge and contacts. Returning to the U.S. when his hitch was done, he attended Manhatten School of Music and gigged in the Newark, N.J. and NYC area. He recalls working with Hank Mobley, Jimmy Smith, James Moody and others. His fondest memories are of working as a regular member of Grachan Moncur III's band. Moncur, a highly regarded but underrecorded trombonest/composer/arranger, apprenticed with Ray Charles and the Farmer-Golson Jazztet in the early 1960's, then set off on his own -- first with hard boppers Sonny Rollins, Jackie McLean and Wayne Shorter -- then with more radical musicians Archie Shepp, Marion Brown and Frank Lowe. (Source: Jazz Music Hound, Steve Holtje and Nancy Ann Lee.) Cootie loved working with him. Cootie returned to Meadville "a long time ago" and became one of the area's great drum teachers. He nurtured such talents as Michael S. Smith, who began lessons with Cootie at age 8. 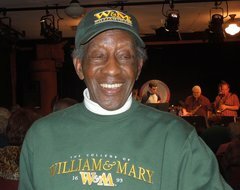 Smith went on to become a drummer-of-choice in the Washington D.C. area, recording with Liebman, Hancock, Hubbard, Roberta Flack, bassist Terry Palmieri and others. Cootie also remembers students (singer) Bobby and (drummer) Billy Wade, who became R&B favorites in the Cleveland area, and then Las Vegas. 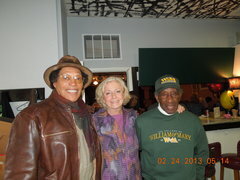 Many other talents in the area learned and received support from the man. Cootie has retired from playing the drums for health reasons. But he continues to lead regular tai chi classes at the Market House and rremains active in his rol;e as one of Meadville's honored citizens.